Deccan Odyssey, one of the leading luxury trains of India, offers a well-planned itinerary Indian Soujourn, offering a memorable journey for a span of 8 days. The journey offers you a chance to explore some of the best destinations of northern and western India including Vadodara, Udaipur, Agra, Mumbai, Jodhpur, Jaipur, Delhi and Sawai Madhopur (Ranthambore). 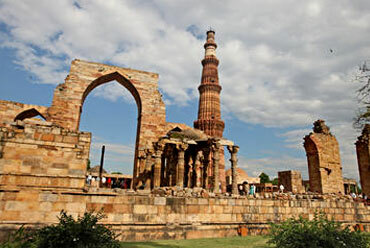 Some of the highlights of the tour include a rendezvous with the big cats, a visit to the celebrated Taj Mahal, exploring historical architectural gems, a boat ride in the placid waters of Lake Pichola etc. Enjoy a grand welcome, indulge in world-class comforts aboard the Deccan Odyssey, relish sumptuous food, admire the impeccable royal interiors of the train and more. Assemble at the Chhatrapati Shivaji Terminus at around 15:30 hours and enjoy a warm traditional welcome. Complete the registration and check-in formalities for your journey. Relish a welcome drink. After finishing the paperwork, settle down in your cabins. You are now free to explore the luxury train, Deccan Odyssey as it departs for Vadodara.Dinner and overnight on- board. The train arrives to the first destination, Vadodara. 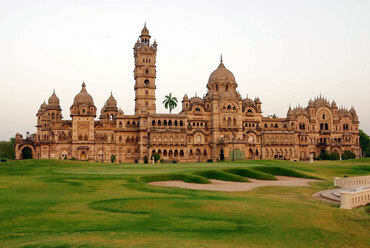 Once the seat of the Gaekwad rulers, Vadodara is one of Gujarat's most important cities. Post breakfast, disembark from the train. Your first visit is to the UNESCO World Heritage, Champaner-Pavagadh Archaeological Park- the only Islamic pre-Mughal city that remained unchanged. The site comprises of water installations, religious buildings, palaces, agricultural structures, palaces and more. Later on, go aboard the luxury train for a sumptuous lunch. Post lunch, visit Maharaja Fateh Singh Museum that is known not only for its fine collection of sculptures, paintings and more but also for its magnificent structure. This is followed by high teat at the wonderful Laxmi Vilas Palace, the residence of the Royalty even in the present times. Enjoy a special folk performances along with dishes from the kitchen of Royalty. Back aboard Deccan Odyssey for an overnight stay. The train starts its journey towards Udaipur. In the morning, the train chugs into the City of Lake, Udaipur that is quite popular for being one of the most romantic cities of India. Relish breakfast while admiring the lovely views of the Aravali ranges. 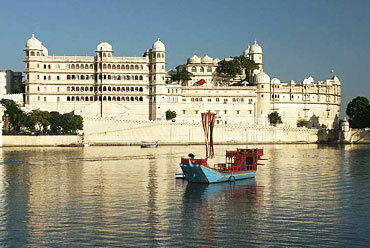 Breakfast is followed by sightseeing tour of Udaipur. Explore the very well-known City Palace complex that was erected during the span of 400 years. The construction of this magnificent structure was started in 1559 by Maharana Udai Singh II on the eastern banks of Lake Pichola. This tour is followed by a boat ride on the placid waters of the Lake. Back aboard the train for lunch. Lunch is followed by a walking tour of Old Udaipur. Get on your hands on some great stuff such as puppets, clothe lanterns, jewellery, wooden boxes, and other handicraft items. Back on-board the train for dinner and overnight stay. The train begins its journey for the next destination, Jodhpur. The train, on the 4th day enters the Sun City of Rajasthan- Jodhpur. 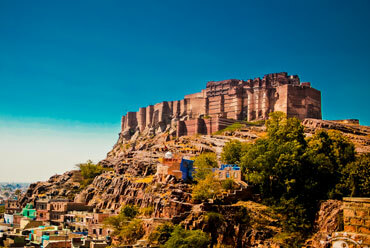 The former capital of the Mar kingdom, Jodhpur boasts of the Thar Desert in the background and houses some amazing temples, forts and palaces. After breakfast, the day is at leisure and you have options to pick from- you can either visit a luxury hotel for a relaxing spa session or you can visit the Bishnoi tribal village along with potter and weavers villages. Get a sneak-peek into the life of the people living there. Lunch on- board the luxury train is followed by tour of the Blue City. Now get all set to explore the mighty Mehrangarh Fort, placed amidst the brown sands of the Thar. 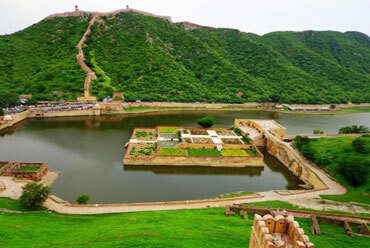 One of country's largest forts, it was erected by Rao Jodha in 1459, on a 150 m high hill. A part of it has been turned into a museum that consists of royal palanquins, armory, paintings, costumes, personal belongings of the royalty and more. Do not miss visiting the colorful Turban Gallery. This visit is followed by a wall around the city to get a sneak-peek into the life of the locals. Walk past the Old Clock Tower market and old but extremely striking havelis. The evening is scheduled for specially arranged lip-smacking Marwar barbeque delicacies that you can savor in the royal courtyard the Mehrangarh Fort. Treat your eyes to the lovely views of the surroundings, while you are standing on the top. Back to the train as it starts its journey towards the next destination, the Mughal City of Agra. Morning arrival in Agra, home to some of the most magnificent architectural gems that were built by Mughal emperors during their reign. 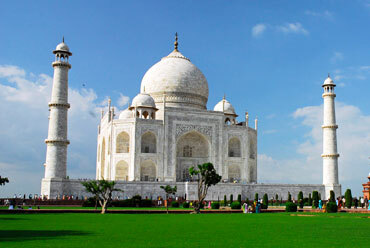 After a relaxed breakfast, get all set to enjoy a visit to the Taj Mahal, one of the Seven Wonders of the World. Built by Shah Jahan in the memory of his beloved wife Mumtaz Mahal, this white marble mausoleum took 22 years to get completed and is festooned with precious and semi-precious stones. Relish lunch at a City Hotel. Lunch is followed by a visit to the Itmad-ud-Daulah tomb, nicknamed as the 'Baby Taj'. Another lovely marble mausoleum that was commissioned by Nur Jahan, Emperor Jahangir's wife in memory of her father, Ghiyas Beg. Do not miss noticing the wonderful latticework. Next visit is to the mighty Agra Fort, another Mughal architectural gem. While some part of the fort complex that is in red sandstone was constructed by Emperor Akbar, the other is in white marble, the favorite Emperor Shah Jahan. The complex has a number structures within its boundaries. After sightseeing, you have options to choose from. You can either opt for a relaxing spa session at a popular city hotel or can visit the local markets of Agra popular for Mughal-style ornaments and special artefacts with marble-inlay. 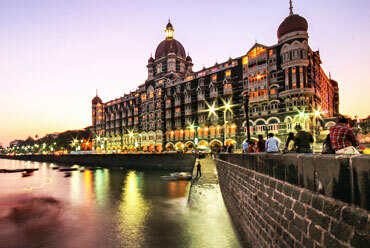 Go on-board the Deccan Odyssey for dinner and overnight stay. The luxury train starts moving towards Sawai Madhopur. Day 6 is going to be an exciting one. The train chugs into its next destination, Sawai Madhopur in Rajasthan, popular for the very well-known Ranthambore National Park. One of the largest national parks in the northern part of the country, it is known for housing a decent population of the big cats. 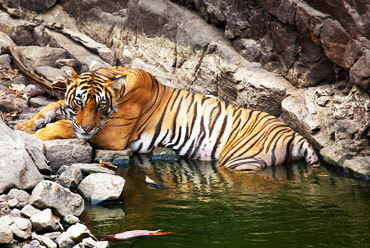 It is quite famous for being one of India's finest tiger reserves. An early breakfast is followed a wildlife safari inside the national park. Along with the big cats, you can also spot other species such as Chinkara, Nilgai, Sambhar, Sloth Bear, Chital and more. Around 272 species of species of resident as well as migratory birds call this national park their home. Back on-board the train for a lavish lunch. You can also embark on a village safari interacting with the turban-wearing men and colorful ghagra-choli wearing women. Interact with the locals. Thereafter, relish high-tea at a popular hunting lodge of the royal family of the region. Late evening, back aboard the train for dinner and overnight stay as it sets off for the Pink City of Rajasthan, Jaipur. On the 7th day of the tour, you are going to explore capital city of Rajasthan, Jaipur, known for its vibrancy and splendor. Post breakfast, disembark from the luxury train and visit the mighty Amer fort (Amber fort). One of the state's most famous forts, it was commissioned by Raja Man Sing way back in the 1592. While the top of the fort offers a nice view of the Maota Lake, it's inside a number of wonderful structures. On the way to the Amer Fort, halt to explore Hawa Mahal, also known as Palace of Winds. This pink sandstone structure is known for its distinct and interesting honey cobweb-like construction. The next attraction that you explore today is the City Palace, a lovely complex known for its carved doorways, gardens, beautiful palaces, courtyards and a museum with a fine collection. Walk past the UNESCO World Site- Jantar Mantar, an astronomical observatory that was built by Sawai Jai Singh in the 18th century. Enjoy sumptuous lunch in a city hotel. After this, you have options to choose from. You can either relax for senses by going for a spa session or you can visit the bustling and colorful local markets of Jaipur to get your hands on colorful handicrafts, traditional clothes, bangles, imitation jewellery and more. In the evening, back to the train for an overnight stay. On the last day, the train returns back to Delhi. After an early morning breakfast, disembark from the train at the Delhi Cantt Railway Station. Arrive at 15:30 hours at Mumbai's Chhatrapati Shivaji Station, registration process and of check-in at the Chattrapati Shivaji Railway Station whereby, luggage is required to be scanned. Please present your passport at the time of check in to collect ticket voucher and relevant documents. Check-in venue is subject to change with prior intimation. All arrival and departure timings are approximate and subject to change by the Indian Railways. All Costs are in USD and INR. Government Service tax of 5% is additional and will be charged extra on the published tariff. As the train runs on the tracks of the Indian Railways, the itineraries are subject to change incase of any changes in the routing etc. Prices are subject to change incase of any amendment in the routing or other hikes such as fuel,taxes etc. Children below 5 years of age shall be allowed free, subject to sharing of double bed with parents. This is subject to availability of double bed at the time of booking. Presidential Suite can accommodate upto 3 adults or 2 Adults and 2 children (One child upto 5 years of age and second child up to 12 years of age) CHILD.